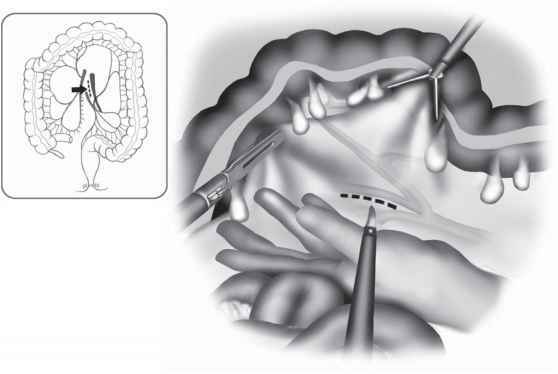 A well-defined operative setup and plan can smooth the progress of a laparoscopic colon resection. By developing a routine approach to patient positioning and instrumentation, anesthetic times can be reduced and the efficiency of the operative team improved. For nearly all cases, an electric table is recommended if available. During the procedure, the patient is likely to be in steep (20' head-down tilt) Trendelenburg position. The patient will then be rotated side to side during cannula insertion and throughout the procedure. The anesthesia team is often much happier and responsive to alterations in patient positioning when using an electric bed. The patient is placed in the modified lithotomy position. This allows the surgeon or assistant to stand between the legs during the procedure, especially during colon flexure mobilization. The patient should be positioned with the pelvis just above the lower table break to allow access to the perineum for pelvic manipulation and transanal anastomosis. The legs are placed in padded adjustable stirrups (Dan Allen Stirrups, Bedford Heights, OH). The use of pneumatic compression stockings is highly recommended for prevention of deep venous thrombosis and possibly to prevent lateral nerve injury to the lower extremities. The legs are abducted 20' to 25' and the thighs should be minimally elevated. Even mild flexure of the thighs (>10') can interfere with mobilization of the transverse colon, because instruments passed through the lower abdominal cannulae may abut the thighs as the proximal and distal transverse colon are approached. To stabilize the body on the table, several additional measures are utilized. A moldable "bean bag" is placed under the patient's head and torso and conforms to the patient with both arms tucked in. Initially, we used padded shoulder harnesses to prevent patient slippage during steep Trendelenburg position. However, two heavy patients (from >700 cases) have developed temporary brachial plexopathy from nerve compression despite the use of heavily padded shoulder harnesses. Currently, a large piece of silk tape (3 inches) placed over the upper chest fixates the upper torso and beanbag to the operating table. Such measures may help prevent vertical or lateral patient slippage during exaggerated Trendelenburg and lateral positioning often called for in laparoscopic colorectal procedures. 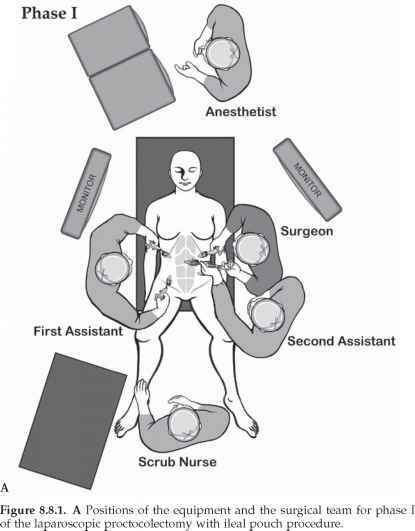 The position of the operative team and monitors will vary throughout the procedure (Figure 8.8.1A-C). The goal of the laparoscopic team is to maintain an appropriate unidirectional orientation of the body, working cannulae, and instruments to the monitor location. Ideally, the eyes, hands, and instruments can all converge on the monitor in a straight line. For the rectosigmoid dissection, two monitors are placed lateral to each of the patient's feet. For right, transverse, or left colon dissection, the monitors are shifted upward to the patient's shoulders. Figure 8.8.1. B Positions of the equipment and the surgical team for phase II of the laparoscopic proctocolectomy with ileal pouch procedure. Figure 8.8.1. C Positions of the equipment and the surgical team for phase III of the laparoscopic proctocolectomy with ileal pouch procedure. Whether you call it erectile dysfunction, ED, impotence, or any number of slang terms, erection problems are something many men have to face during the course of their lifetimes. How to support a patient on operating table in steep trendelenberg? How to use shoulder positioners in steep trendelenburg?